Marrero, Chamizo, Marcer Law, LP has been representing client with their family law matters for over 30 years. Our Family Law Attorney Miami Lawyers work hard to obtain the results you want in domestic relations involving divorce, property settlements, paternity, parental rights, adoption, visitation, child custody, post-divorce, or guardianship matters. For any Family Law Miami FL case, you deserve to have one of the best Miami Family Law Firms at your side. Our Family Law Attorney Miami Fl Lawyers will provide you with experienced legal guidance and legal representation around. The Family Law Attorney Miami Lawyers at Marrero, Chamizo, Marcer Law, LP, offer every client facing a family Court Miami process the professional legal counsel they can rely on for all family law matters. 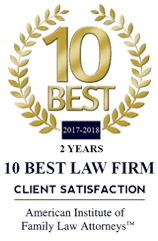 We have been voted 10 best law firms for family law by the American Institute of Family Law Attorneys for our exceptional and outstanding client service. As a Better Business Bureau A+ Accredited Business, our Miami Law Firms value our clients trust. Below, please review some of the services we provide. Don’t hesitate, call 305-446-9466 to schedule your initial free case review with our top rated Family Law Attorney Miami Lawyers. Our Miami Family Law Firms conveniently located at 3850 Bird Road, Miami, Florida 33146 on the 10th floor in suite 1001. We are just steps from Douglas Road in Miami and Ponce De Le Boulevard in Coral Gables, off Bird Road near the Shops at Merrick.